Based in Washington, D.C., USA, Watershed Associates, Inc. provides consultative training in negotiation skills worldwide. Consultative negotiation training blends traditional consulting assessment and advice with the delivery of dynamic and results-oriented negotiation training. A critical point, event, or activity that marks a division or a change of course; a turning point. Practical Application: Expert practitioners versed in cutting-edge academic thinking and research on negotiation process, strategy and behaviors translate this body of knowledge into practical application to help resolve your complex business needs. Tailored Negotiation Training and Advice: Advice on negotiation strategy and workshop content are targeted to the competitive environment and industry in which you operate and the real world negotiation challenges you face. Each individual workshop is tailored and can be customized to your organizations unique requirements. Participant Centered: Our use of adult education techniques ensures that participants leave with the tools, confidence and talent to use negotiating skills more effectively and efficiently. Post-workshop Online Negotiation Skills: Watershed's clients also benefit from access to post-workshop support, including continuing negotiation skill development at our Negotiator's Learning Center (NLC). The NLC provides an online tutorial in negotiations with content that is comprehensive, constantly updated, and is easily searchable and mobile friendly. Our comprehensive approach helps clients to build a core competency in negotiations for their teams. Take a look at our Negotiation Workshops overview. Much more than a negotiation training provider, Watershed Associates is distinguished by its range of negotiation expertise and how we deliver our negotiation services. Since 1993 Watershed Associates has provided consultative training for sales negotiation, procurement, project management, and operations throughout a multitude of industries. We have delivered thousands of interactive negotiation workshops, keynotes, and consulting services on essentially every continent to hundreds of organizations, from the Fortune Global 1000 to start-ups, from government agencies to associations and non-government organizations (NGOs). Watershed Associates builds relationships with clients the same way we help clients build relationships with customers, vendors, partners, and all business connections – with integrity and substance. To help you exceed your organizational goals, we profoundly impact every participant’s negotiation skills in such a way that they create their own watershed. 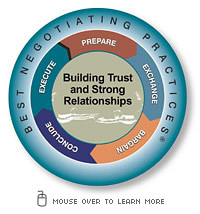 Best Negotiating Practices, a set of skills, behaviors and strategies that move you from fundamental understanding, to proficiency, to mastery in negotiations. Great training and did provide an excellent team building opportunity. It will encourage me and the organization to move to more structured planning. It will provide a common vocabulary for internal development of proposals. Presentation was a good mix of presentation and exercise that kept everyone engaged.